As I’ve mentioned before, our Summer Reading Club theme this year is Funny Business. What better excuse to throw a Silly Songs Dance Party! I was completely inspired by magnanimous Angie at Fat Girl Reading who shared her Baby Dance secrets including her playlist! A lot of these songs I stole from her, but the rest I either already knew or found by going through the Music CDs in my collection. When creating this program outline, I knew I wanted to have a mix between recorded music and just us singing. I also knew I wanted a mix of high energy and low energy songs because let’s be real – 1 hour of dancing is a lot for both me and the kids! I definitely over planned – this outline is probably enough for two hours, but I’m glad I had lots of options to choose from because I wasn’t sure exactly how many kids would show up or how old they would be. We did advertise this as a family program, and I got kids ages 2-12 joining in. Logistics wise, all I did was clear out a large space in our program room for the dancing part. I had two tables along the side with a display featuring Music CDs and books about dance and music. Then I had one table up front where I could put the CD player (yes, I’m old school), my water bottle, the egg shakers, and my program notes. Then I had a flip chart on an easel with the lyrics printed for all the oral songs. Easy peasy. Here’s what we did! When possible, I’ve provided links that allow you to listen to the songs. Laurie Berkner is my all time fave. We marched around the room and it was awesome. This song is quite fast paced, but the kids were busting up laughing just trying to freeze at the right time. The kids needed a little break at this point, so we sat down for this one. I added in a dramatic play element – we put on our seatbelts, got dressed in our fire gear, got a call about a fire, slid down the fire pole, and then sang this song. My 3-year-old niece is obsessed with this song so it was no surprise that it was the best song of the whole program. We acted out the whole thing; the kids loved chasing each other around. One of my new favourite songs! We pointed out all of our body parts as we listened. Such a great beat. 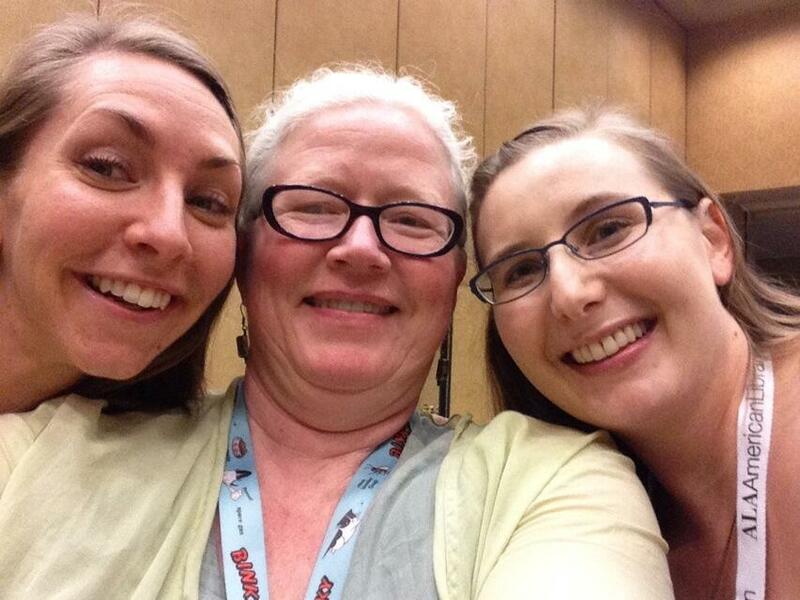 So a few weeks have passed since the glory that was #alaac14. We’re mostly surviving. I thought writing this post would help keep the magic alive. Well this post and this picture. Words cannot capture how it was amazing to meet all these folks in real-deal life, these folks and so many more. We were also fortunate to attend some pretty amazing sessions and wanted to share the highlights for those of you at home. 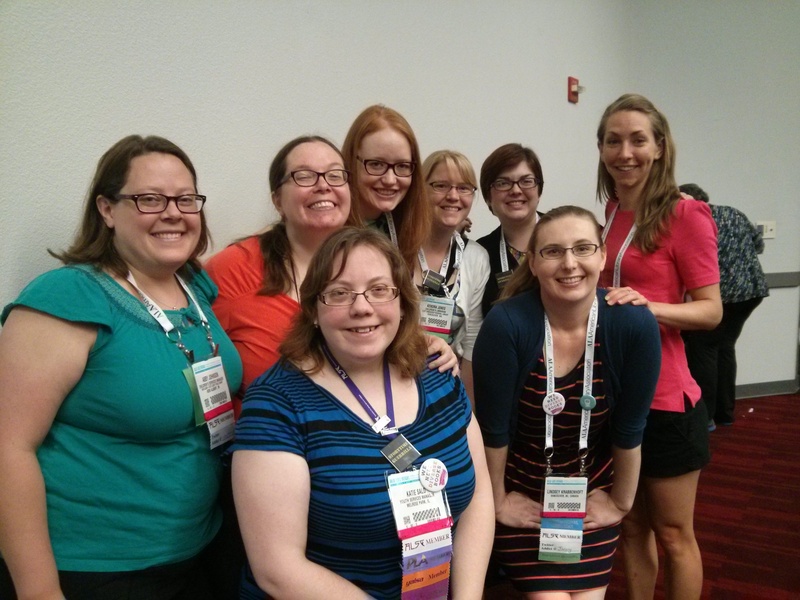 For other great ALAAC 2014 recap posts be sure to check out Storytime Underground’s full recaps from all FOUR GUERRILLA STORYTIMES Friday, Saturday, Sunday and Monday as well as write ups by Amy here and here, SLJ and SLJ Teen. One more glorious picture before I start session talking of Angela, our Mentor/Fairy Godmother and us. So much love! They bring the focus back to the books. I’m completely over one-off craft programs that require no creativity or innovation. You can promote your collection – Read alikes, anyone? How about some non-fiction that would pair well with the book? You can include literacy based activities and the kids won’t even care because it is SO FUN. They draw on kid culture – What books are your kids interested in? What book won’t stay on your shelves? Start there. So here is a round up of the amazing ideas everyone shared with me, plus some that I found on my own. Alice in Wonderland Party by What is Bridget Reading? Mad Hatter Tea Party by What is Bridget Reading? Kitt Kittredge: An American Girl Event by What is Bridget Reading? Molly: An American Girl Event by What is Bridget Reading? Kirsten: An American Girl Event by What is Bridget Reading? Clifford the Big Red Dog Birthday Party by What is Bridget Reading? Dr. Seuss Party by What is Bridget Reading? Fancy Nancy Party by What is Bridget Reading? Fancy Nancy Christmas Party by What is Bridget Reading? Harry Potter Party by What is Bridget Reading? Laura Numeroff Party by What is Bridget Reading? Mouse and Friends Party (Laura Numeroff) by What is Bridget Reading? Elephant and Piggie Party (and Pigeon Too!) by What is Bridget Reading? Mo Willems Party by What is Bridget Reading? Pete the Cat Party by What is Bridget Reading? Winnie the Pooh Party by What is Bridget Reading? Peter Rabbit Party by What is Bridget Reading? If I’ve missed a book character party you’ve written up somewhere, please leave a comment and I will add it in to this post. Or if you have any ideas for how to better organize the categories, let me know. While so much has happened since we wrote this up (including meeting so many of these amazing folks!) we stand by the awesomeness of the work they do. Please check out our most recent round-up of Youth Services gold! We love discovering awesome storytimers and love it even more when we find out we’re practically neighbours. Leah, a Children’s and Family Literacy Librarian from Victoria, BC is both of these and therefore our Storytimer of the Season! You can check her out her blog Time for Storytime, or peruse her amazing Pinterest Boards like the one she created for our Summer Reading Club theme Funny Business. We love a good joke but there ain’t nothing funny about solid professional development and these last couple of months have definitely delivered. If you have not yet read Amy’s piece on Professional Development in Youth Services we’ll wait. She follows this rallying cry with a presentation on Effective Advocacy for Youth Services which she delivered at PLA 2014. When it comes to advocating for what we do one of the best tools is information. The folks at CLEL can always be counted on for great information like this series of posts on Developmental Milestones. It never hurts to have articles like this one on the benefits of investing in preschool and NPR’s look at what constitutes “high-quality” preschool when talking to caregivers or library administration. Next up some quick and very cool early literacy goings on: Marge and Brooke talk about their Early Literacy Area and how it evolved here and here. We love how Ingrid posts early literacy tips behind her desk like “You don’t have to finish every book, you know.” And finally an early literacy section wouldn’t be complete without Lisa’s too-cute-for-words Early Literacy Kits she put together for families to take home. For a slightly older crowd Sara Bryce provides her usual dose of humour and smarts in this piece on differentiated programming (aka literacy for all) and Rebecca talks about the neato storytelling launchpad she discovered in Storybird.